Effective immediately, Q2i devices can now be paired with R2c readers. However, this is only possible for Q2i devices with a core board that is version FEM800. When purchasing a brand new Q2i terminal, remember to notify the sales person that the terminal is to be paired with R2c as the slave reader. 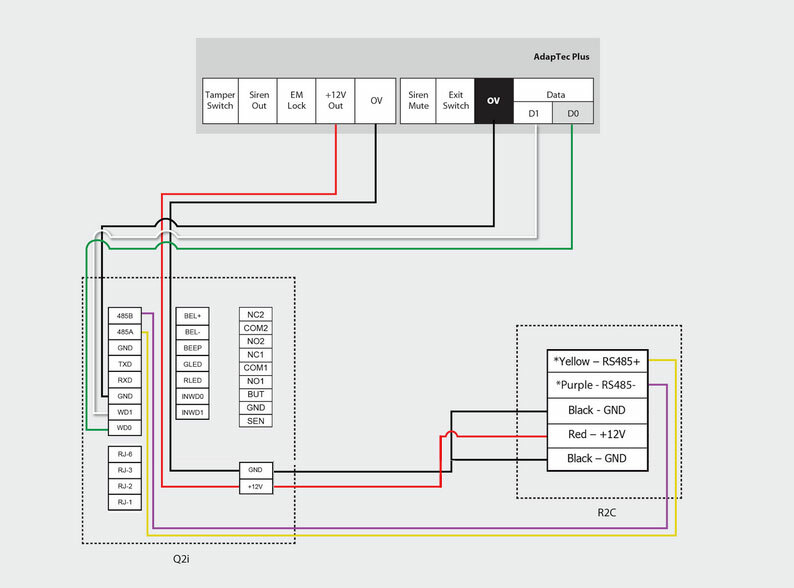 If you are already using a Q2i device at your place, please check the core board's version (either FEM600 or FEM800) before pairing it with an R2c reader. 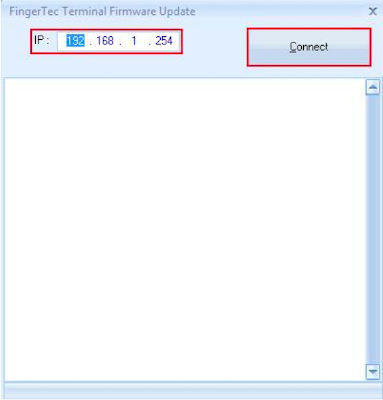 You can check this info by using the FingerTec Device Info tool. Read more for the step-by-step guide to enable the Q2i-R2c pairing. 1 - Insert the Terminal's IP address and click Connect. 2 - Click the Update button to update the device. After the update is complete, the terminal will automatically restart. 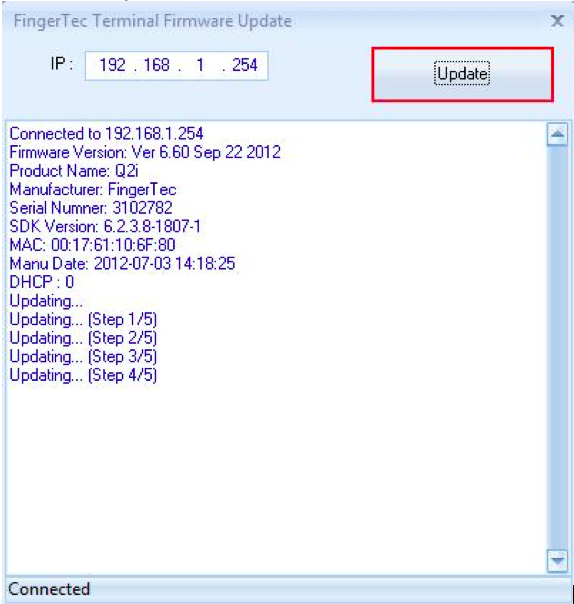 You may download the Q2i firmware update here and FingerTec Device Info Tool here. 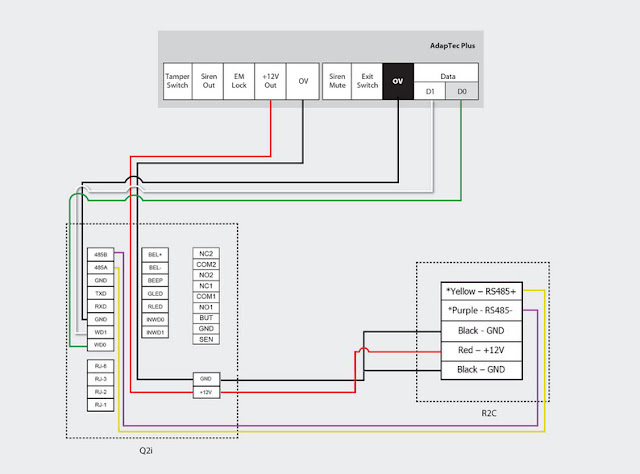 For your reference, below is an installation diagram for the Q2i and R2c devices with the new AdapTec Plus. I have installed H2i outside of my office and inside Q2i installed and also I have installed magnetic lock. 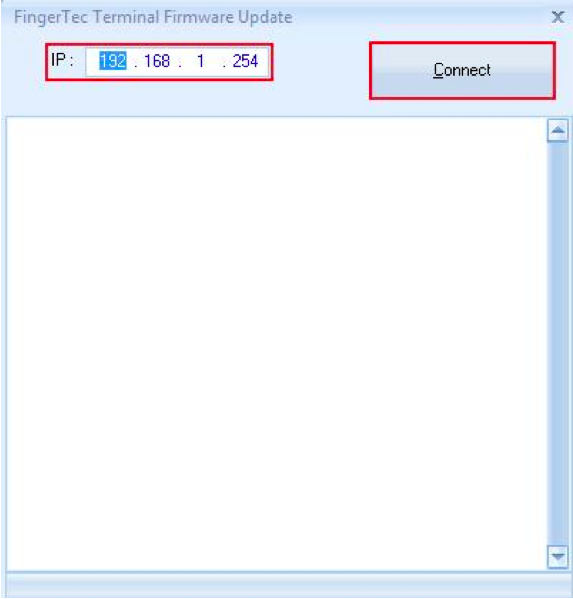 I want to connect H2i, Q2i, Magentic Lock and Exit Switch to an FingerTec Adaptec Plus controller. Help me to configure this. Refer http://www.fingertec.com/customer/download/postsales/HAC-AdapTecplus-E.pdf at page 7 for more detail to connect H2i, Q2i , magnetic lock and exit switch with Adaptec Plus. If you need any other information please do not hesitate to contact me again. Thank you and have a nice day. Thanks, In Q2i NO1 and NO2 is there, so which one I have to connect it. You can use the NO1. Without activating can we enroll the finger in H2i. kindly help me. Yes. Without doing the software terminal activation first. You still can enroll fingerprint at the H2i. Firmware V.6.4.1 600 (Build 31-1097-06) while updating the terminal using Terminal update tool its not getting updated. When I press Release button magnetic door lock is working, but when I press the finger in terminal its verifying but not releasing the lock. I'm trying the same to H2i my slave machine. Kindly help me. Or please add my Skype (ID : fingertec.yusri) or Google talk (yusri.fingertec@gmail.com) for better discussion. Master works well, but the slave does not recognize the card and fingerprints, which are registered in the Maste. R2c will works for Q2i devices with a core board version FEM800 only. In regards to your inquiry, may I know which software that you're using either TCMSv2/TCMSv3 or Ingress? Besides that, may I know the device is connected to the software by using TCP/IP or you downloaded all the data by using USB pendrive?